Sensata Technologies develops and manufacturers high quality Airpax™ modular distribution systems for easy "plug 'n play" circuit protection. 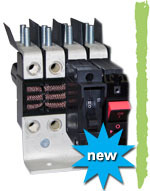 Developed for use with Airpax™ IAL series (IEL, IML, LEL, LML) circuit breakers with 5/16" bullet terminals. Description : Newer, lighter weight, space-saving modular system design for DC power distribution. "Hot Plug" modules allow for equipment expansion without power shutdown. Modular load terminals available with top or rear access. Unique alarm conductors simplify signal wiring.